A visit to the Tweed in autumn is an annual pilgrimage for many salmon anglers, not only because the fishing is amazing but also the Tweed valley looks splendid in its fall colours. There is no doubt the fishing is world class but are you prepared to make the most of it? A little thought and preparation will go a long way towards ensuring success, and it really pays to take a casting lesson or two a couple of weeks before you set off. You definitely need to start fishing effectively the moment you hit the river. Please learn a few of the speycasts so you can fish regardless of wind direction or the bank you are casting from. The beat ghillie may well be able to help if you are struggling, but surely this is a waste of valuable fishing time – the best fishing is far from cheap after all. Farlows and Sportfish offer a range of tuition options to suit everyone from hourly lessons to residential courses. This link will take you through to the tuition area on our website or if you prefer call Sportfish Reading on 0118 930 3860. Through the middle and lower river the Tweed is a substantial body of water and to cover it effectively a 14’-16’ double-handed rod is needed with a fifteen footer being the weapon of choice. Most will be 4-section models making them easy to transport. Please take a moment to tape the sections together by winding a touching spiral of tape up and down the rod blank overlapping each joint by at least 5cm on either side. This will prevent the sections from working loose as you cast – casting with loose joints causes many avoidable breakages. You will also need a hard plastic case particularly if you fly to protect your delicate rods from the worst the airlines can throw at them. Here are a few suggestions for rods that we rate highly and have the necessary qualities needed for early and late season fishing on the Tweed. Reels are very much a matter of personal preference; I would go for a modern large arbor design capable of holding a full flyline plus around 200m of 30lb backing. Couple this with a smooth disc drag system and you have the perfect reel. Some may prefer a more traditional design with a noisy click and pawl system – this would give me a headache but at least everyone will know when you hook a fish! 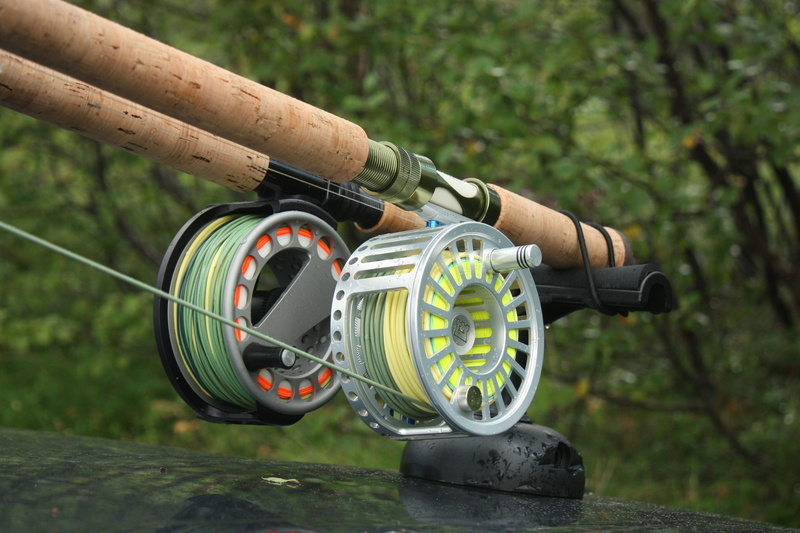 Here are three reels that you can rely on to do the job. Lines are the subject of much debate – simply because the salmon angler is faced with a bewildering array of choices nowadays. My preference is for shooting heads for early and late season fishing. They are easy to cast and allow endless tactical variations by carrying shooting heads in a range of densities. A spey line with sinking tips is another useful option, but make sure you are carrying some really fast sinking tips for extreme high water. So there are a few tried and tested options for your main tackle items all of which will perform admirably on the Tweed this year. Whilst it’s important to have tackle that is balanced, arguably keeping warm and dry in poor conditions is essential. Unless you feel comfortable you will not fish well and you certainly won’t enjoy being on the riverbank. Modern clothing is lightweight and easy to wear. There is no excuse for packing up early to head for the warmth of the hut! Our preference is for stockingfoot waders with separate purpose designed wading boots. Modern waders are constructed from breathable fabrics that allow moisture to escape away from your body back into the atmosphere whilst at the same time remaining 100% waterproof. Our range includes product from our premium clothing suppliers Simms and Patagonia, both of these brands bring high performance clothing and wading gear that will equal anything the weather can dish out. Remember to build up under layers of fleece materials on cold days beneath your waders and wading jacket. You can then adjust these layers as temperatures change throughout the day. So there is a brief guide to tackling up for the Tweed – if you would like further advice please call Farlows in London on 0207 484 1000 or Sportfish on 01544 327111.